Cardless Cash is a feature of the RepublicMobile App and RepublicOnline (personal) which allows users to access up to TT$500 daily at any Republic Bank Blue Machine without the use of a card. These funds can be sent to yourself or anyone with a mobile number. 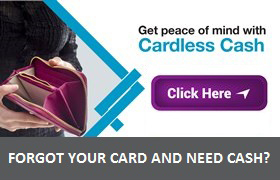 What do I need to access Cardless Cash? Simply log in to either the RepublicMobile App* or RepublicOnline (personal) service and select the desired Cardless Cash option (“Payment to Myself” or “Payment to a Third Party”) via the Transactions tab in the main menu of RepublicOnline or via the Transfer Funds tab on the RepublicMobile App. The recipient, who isn’t required to be a Republic Bank customer, can then visit any Republic Bank Blue Machine. How extensive is the ABM network? With over 120 Blue Machines nationwide, our network spans across Trinidad and Tobago. Find the closest one to you by clicking here. This may have occurred due to network related issues wherein the message may have failed to send. In such instances, the Recipient should advise the Sender of non-receipt within 5 minutes. Once the Sender confirms that the transaction was initiated successfully, the Sender can either provide the Recipient with the code(s) or contact our Call Centre at 623-4RBL (4725) to advise us of the issue. The same Cash Code can be used at another Blue Machine, once the cash withdrawal was not completed and the transaction period has not expired. If the Cash Code has expired, an error message will be displayed at the Blue Machine advising that the Code has expired and that the Sender be contacted. If the withdrawal is not completed by the Recipient, how long after will the funds be credited back to the Sender’s account? The Recipient can visit any other Blue Machine using the same Cash Code and Transaction ID, to complete the transaction and retrieve the funds. The Sender should raise a query either in person via the branch network, via our Call Centre at 623-4RBL (623-4725) or via email at internetbanking@republictt.com. You will be required to update your mobile number on your RepublicOnline profile via the My Profile tab in the main menu. This is to ensure the delivery of SMS messages with the Cash Code and Transaction ID to the updated mobile number. As a security measure, the Recipient will receive two sets of information: a Cash Code and a Transaction ID. This data will only be available for a 48 hour period, after which, the Cash Code and Transaction ID will expire. Are there limits on Cardless Cash transactions? Yes. The daily transaction limit is TT$500.00 and transaction values must be divisible in twenty dollar (TT$20.00) denominations. Is there a limit to the number of transactions per day to the same recipient? As a security measure, the Transaction ID and Cash Code expire 48 hours after the successful submission of the transaction by the Sender. How many attempts do I have if I enter the wrong combination? The Recipient has a maximum of three (3) attempts for the Cash Code/Transaction ID combination. After the third attempt, the transaction will be cancelled. How can I be sure that the Recipient receives the payment? The Sender receives notification via email and SMS, stating that the transaction has been completed. 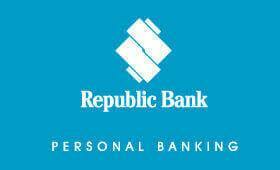 Will the information gathered by Republic Bank through Cardless Cash be kept confidential? In keeping with the Bank’s policy on customer confidentiality, all customer information submitted to us through the Internet or SMS will be maintained with the strictest confidence. Republic Bank will not disclose any customer information unless specifically authorised in writing by you to do so, or where disclosure is required or permitted by law. Know that Republic Bank will never present you with unexpected websites or send you unsolicited e-mails asking for your Password, Personal Identification Number (PIN), credit card details, account numbers or any other confidential information. Report any suspicious requests to Republic Bank immediately at 623-4RBL (4725). You may contact our Call Centre at 623-4RBL (4725) or you may send your feedback via email to internetbanking@republictt.com. You can also contact your banking branch representative at 625-3617. What are the Call Centre’s hours of operation? And what should be restricted to the Call Centre? We have a team of trained, helpful staff, available 24 hours a day, 7 days a week, to handle your calls at 623-4RBL (4725). All matters related to registration, passwords, security and Internet Banking and SMS Banking services can be referred to the Call Centre or to your banking branch. All enquiries related to transactions on your accounts should continue to be directed to your banking branch. Is there a transaction fee for Republic Bank Cardless Cash? A transaction fee of TT$4.00 is charged to the Sender of the transaction upon the successful completion of the cash withdrawal. While the charge will still appear on the confirmation screen, it will not be debited from your account as Cardless Cash fees will be waived until June 30, 2018. Is there a charge for the SMS messages sent/received? Yes. There is a fee of approximately TT$0.55 for each message sent and received, which is applied by your mobile service provider. Will the SMS fee be debited from my bank account? No, this fee is applied by your mobile service provider for messages that are sent and received based on your mobile plan. RepublicOnline (Personal Internet Banking) makes managing your accounts and paying your bills easy and safe from any location via any device with a browser and an internet connection. See how RepublicOnline can benefit you – click here to see the list of transactions that can be completed as well as the available bill payees or click here for our interactive demos. You're pretty busy. We get it. That's why we've made our mobile app so easy to use. Bank on your own time, wherever and whenever; while doing what you love. Check out our interactive, easy-to-follow demos on how to use the RepublicMobile App, here, or view the Frequently Asked Questions here. For basic information, view or download the RepublicMobile App Brochure here. RepublicMobile App users must be registered for RepublicOnline before gaining access to the app.